Successfully Added DOOGEE X3 Smartphone - 2 SIM Cards, Android 5.1, Smart Wake, Gesture Sensing, Bluetooth 4.0, 1GB RAM + 8GB ROM (Black) to your Shopping Cart. 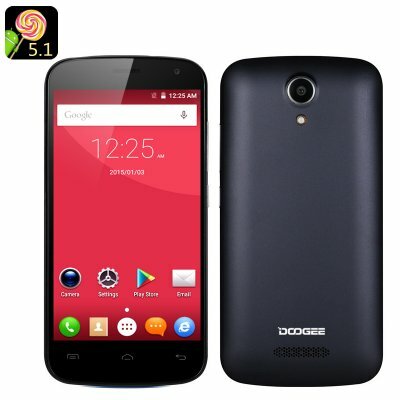 The DOOGEEX3 comes with a 4.5 inch screen – and, unlike large phablets, is much more compact and easy to carry around. There are lots of benefits that come with a smaller screen. First, your smartphone will be less prone to damage and will most probably withstand hard surface drops much better than larger screen devices. Second, a 4.5 inch screen phone is not bulky and can easily fir into your back pocket. Third, you will be able to efficiently navigate the phone with one hand. So, if you have your coffee-on-the-go in one hand, you can still operate the smartphone with ease. Despite its small size, the DOOGEE X3 sports quite a few cool features. You will definitely want to try out Smart Wake and Gesture Sensing, which will let you get quick access to favorite apps and use gestured for to control certain features. The basics are all there as well: fast Bluetooth 4.0 connectivity, an efficient quad core processor, 1800mAh battery, two cameras, 3G connectivity and two SIM cards. Another advantage is Android 5.1 – the new OS features lots of cool upgrades and, of course, access to more fun stuff at the Play Store. The DOOGEE X3 smartphone comes with a 12 months warranty, brought to you by the leader in electronic devices as well as wholesale Android.